In Dakar, taxis are yellow and white. 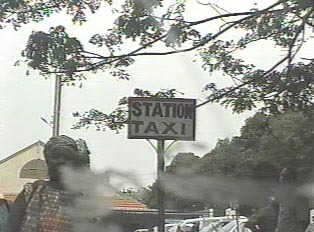 Normally, they are owned by an individual; there is no particular taxi company in existence. Although one does not normally call for a cab, the use of cell phones is changing that, and some cab owners have begun to advertise phone numbers. Otherwise, cabs are hailed on the street. There are no meters in Senegalese taxis; it is necessary to agree on the price before the ride begins. The fares are relatively inexpensive, and cabs not only travel to each part of the city, but are also willing to go into the suburbs. Given that Senegal is an outdoor culture with much going on late into the night, cabs tend to run the better part of twenty-four hours. Taxis are generally safe for women during the day, but women traveling at night should not use taxicabs unless they are with male companions.